Rabies shot: All the vaccinations you will need against rabies. 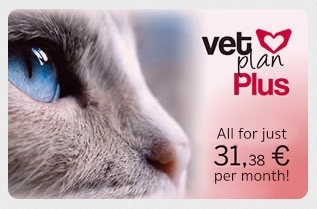 Extra vaccination: The vaccinations required to prevent the most common viral and bacterial infections in our part of the world , including leptospirosis (transmissible to humans), canine distemper, canine viral hepatitis and canine parvovirosis and, in the case of cats, prevention of calicivirus, rhinotracheitis, feline panleukopenia and feline leukaemia. Deworming: Every three months your associated veterinary centre will apply the treatment required to prevent the most common intestinal parasites, including echinococcosis, which can be transmitted to humans. Treatment for fleas and ticks: Once a month your associated veterinary centre will apply the treatment required to prevent flea and tick infestations and the diseases carried by these pests. Annual check-up: Includes an annual veterinary check up for your pet and a blood test to monitor the main haematological and biochemical parameters, allowing for early detection of possible health problems. 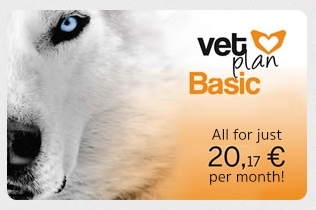 Unlimited visits to the vet during the term of the contract for the special price of €10 per visit. To do this you will need to request an appointment from your centre (THIS PRICE DOES NOT INCLUDE SPECIALIST VISITS OR VISITS DURING EMERGENCY HOURS).